Where Are the Catholic Environmentalists? The sister was wrong, I thought. Elizabeth Johnson, C.S.J., a theologian and professor at Fordham University in New York, was talking to Catholic school teachers about ways to integrate environmental concerns into classroom lessons. Personally, I considered environmental concern a white privilege. I did not have time to teach it to my inner-city students. Sister Johnson argued that social justice and environmental activism are necessarily linked and gave examples of ways to integrate ecology into an inner-city school’s daily life. It was intriguing, but I didn’t quite buy it. I do not think I was alone in downplaying the environment. While a recent Gallup poll indicates that over half of all Americans believe environmental quality in this country is getting worse and that our leaders are not doing enough about it, I did not see the same level of concern reflected in my experience as an American Catholic. I have never heard a homily about ecology, although in various parishes I have heard dozens about abortion or the war. I receive countless direct mailings from Catholic organizations, but I do not recall ever receiving one about the environment. There are many books that discuss religion and environmental awareness. But where is the action? The action, I am learning, is not national, and it often is not issue-driven - at least not in the traditional sense of pushing a few important measures through Congress. Sure, there are Catholic environmental public policy recommendations, and yes, there are Catholic environmental groups. But the really exciting work in environmentalism is going on locally, and the most pressing changes are occurring not in issues but in attitudes. Catholics across the country are beginning to rethink how they relate to the Earth and to re-evaluate their role in the ecological balance, and they do not need big national movements or massive mailing lists to do it. After all, this is ecology, so the best way to go is organic, and the best way to start is from the ground up. Mark Stoll, a history professor at Texas Tech University, in Lubbock, Tex., argues that Catholics have not been prominent environmentalists in the past because their religious worldview encouraged a sense of sacredness among a community of people rather than with nature. In a paper entitled "The Catholic Ethic and the Spirit of Environmentalism," Stoll writes, "Religiously-minded Catholics dedicated themselves in service to the Church, or to the poor, or to the unconvertedto society, in other words...and by and large left nature writing to Protestants, alone in the woods with their God." While Catholics have certainly always appreciated the natural world, their passion for ecology has usually been an afterthought to their commitment to social concerns. But, as Professor Stoll points out, ecology is becoming a social concern. In his statement for the World Day of Peace in 1990, Pope John Paul II said, "the ecological crisis is a moral issue [that] has assumed such proportions as to be the responsibility of everyone." In response, the U.S. Conference of Catholic Bishops issued Renewing the Earth, in which they insist that the ecological problem is intimately connected to justice for the poor. How, they ask, may we apply our social teaching, with its emphasis on the life and dignity of the human person, to the challenge of protecting the earth, our common home? They answered the question, in part, by founding The Environmental Justice Program. Alongside support for scholarship, leadership development and efforts to influence public policy, the E.J.P. has provided over 150 small grants to community organizations. Projects have ranged from educational retreats across the country to large-scale organizing against the destruction of wetlands in coastal Louisiana. "While the E.J.P. no longer offers grants, the programs created still serve as models of how small communities can effect both local and national change. They have national policy impact," said Walter Grazer, director of the U.S.C.C.B. program. "It’s a bit like an orchestra; it’s got a lot of different instruments, and you hope at the end of the day it’s a sound people can recognize." Renewing the Earth also provides a clue to why Catholic environmental action is not as well known as it might be. The document offers an impressive list of environmental efforts made by the Campaign for Human Development; everything - from an effort in Washington State to reduce pesticides in the apple industry to a community coalition in Mississippi seeking greater access to clean drinking wateris local. Carol Coston, O.P., believes that Catholic environmentalism is predominantly local because that is how it should be, not just socially but ecologically. When people recognize how connected they are to the local community and even to the local land, she argues, that necessarily calls for subsidiarity. A co-founder and former director of Network, winner of the Presidential Citizens Medal and an acknowledged expert and leader in socially responsible investing, in 2001 Sister Coston founded Santuario Sisterfarm in central Texas. Proceeding from the idea that the land and human life are parts of the same ecosystem, many of the Santuario’s projects combine the empowerment of localLatinawomen with the modeling of sound environmental practices. "Wherever you’re planted," Coston says, "that’s the logical place to start." Al Fritsch, S.J., knows a great deal about the difference between work on the national and on the local level. A former scientist for Ralph Nader and the cofounder of the Center for Science in the Public Interest, Fritsch is the founder of AppalachiaScience in the Public Interest. ASPI is best known for its resource assessment service, which has created 10-year action plans on environmental issues for over 150 nonprofit organizations in 30 states, according to an interview Father Fritsch gave to the Web site Inner Explorations. Father Fritsch used to do a lot of national organizing; now he finds resource assessments far more effective. On the national level, there is always too much infighting and rarely any impressive results. Alliances with other environmental groups are not overly productive, either. We’ve seen misrepresentation by larger environmental groups, explains Father Fritsch. We don’t want to work with groups that have a take-over attitude toward things. In the end, while Father Fritsch acknowledges that both approaches have a place, he believes that the best work starts personally. "I don’t want to deny that we have to work on the national or international level. I’m saying that as Catholics, we have a better infrastructure to work through parishes and to take responsibility for actions on a personal level than we would on setting up a national organization." The Rev. Ray Kemp agrees that parishes are a necessary part of this solution. He just wishes more priests thought so, too. Father Kemp directs Preaching the Just Word, a program based at the Woodstock Theological Center at Georgetown University in Washington, D.C., that helps priests and other ministers of the Gospel to integrate justice better into their preaching. When I wondered aloud why I had never heard a homily about the environment, he replied: "When I ask pastors to name the issues of justice, invariably (and we’re not talking about a majority here)...the best and the brightest name the environment. The other ones look at it and say, 'My God, you’re right; I had never thought of it.’"
This lack of preaching, for Father Kemp, reflects a deeper lack of connection to the Earth. If the best environmental activism is local, then environmental awareness must begin with local, even immediate, concerns. "It is a question," says Walter Grazer, "of what people are kind of familiar with." He adds, "People generally don’t have radical conversions; we generally move more at a snail’s pace." Father Kemp believes that for priests to begin preaching about the environment, they will have to start from the level of the pocketbook of their parishioners and their parish. Of course, one of the most important elements of subsidiarity is that sometimes larger institutions are needed to do the things the smaller ones cannot. "You need some place that’s like a hub," says Grazer. If there’s no hub, you’ve got a lot of spokes, but they don’t connect. David G. Andrews, C.S.C., director of the National Catholic Rural Life Conference, concurs. You need a national organization to do the public policy work. Local environmental action needs to have a policy component in order that those good works, those good practices, get appreciated on a policy framework on the state and national level, and indeed, the international level. Grazer hopes that the U.S. Conference of Catholic Bishops can serve as that hub. The U.S.C.C.B. has a tradition of teaching and advocacy that naturally extends to the environment. Its centralized, national status lends itself to the making of policy recommendations. All of this policy, however, points back to the experience of rural life, which requires a concern for all of God’s creation. If you go back into our history, notes Andrews, we’ve always articulated a vision of care for creation and care for community. Andrews speculates that Catholics’ lack of passion about the environment may be a function of the fact that most of them live in cities. It’s a lot easier if you live in rural America to have a vision of God’s communion with humankind through creation. The question, then, is how to make it easier for all Catholics to have a vision of God’s creation. Paul Gorman, executive director of the National Religious Partnership for the Environment, argues that people are not going to make the environment "a critical issue until they have an awareness of the question of human purpose in the greater web of life." The environment cannot be reduced to one issue among many, he warns. Rather, environmental awareness must take the shape of a "religious awakening." Until it does, no one is going to pay attention to a sermon about global warming. Also calling for a new way to understand our relationship to the environment is Miriam Therese MacGillis, O.P., the founder of Genesis Farm in Blairstown, N.J. A proponent of "the new cosmology," Sister MacGillis, like Mark Stoll, believes that the traditional Catholic commitment to justice is centered on "the human in [the] beginning, middle, and end of our concerns." To change the environment, she proposes, we have to change our entire cosmology. Fundamental is a sense of humanity as part of creation, rather than as master of it, and an acknowledgment of all creation as worthy for its own good, rather than for the good of human beings. You reverse everything when you do that. You see that the future of humanity is totally aligned with the future of the planet. Sister Elizabeth Johnson writes that there are two ways to approach the ecological crisis in good faith: the stewardship model, which envisions the Earth in the service of humans; and the kinship model, which envisions humans in the service of the Earth. The conclusions to which these two ways lead are usually similar, though the routes to them are often quite different. Both, for example, would want to stop extinctions: the stewards because these are animals and plants for which we have been given responsibility and that might have valuable cures; the kinship approach because each plant is a life with an integrity all its own. Both Sister Johnson and Sister MacGillis believe that the stewardship model would be a welcome improvement on what our government is doing now. Sister MacGillis worries, though, that this way of thinking is just not enough. "It hasn’t made the shift from a human material culture walking on a dead, material planet," she said. Sister Johnson says that we must link our preferential option for the poor to the Earth as a whole, thinking of the Earth as "the new poor." Both would agree with John Paul II’s statement in 2002 that "[we] must encourage and support the 'ecological conversion’ which in recent decades has made humanity more sensitive to the catastrophe to which it has been heading." As Sister Elizabeth Johnson wrote to me, "It would be great if we even got as far as the stewardship model.... Our rapacious policies and attitudes are a long way from there. But once you start to work with this issue, and begin to love the earth, then your spirit moves to kinship. It happens on the level of spirituality." She adds, "The most important thing might be to pray." Maybe the sister was right after all. It was one of those "you had to be there" moments. The February 13th copy of America arrived in my dining room, via my husband, in the midst of a clutter of papers, books, articles, and my lap top. I was preparing a power point presentation to be given this coming April at two sites in the diocese of Brooklyn (I work for the diocese in lay leadership formation) to Catholic School teachers and Directors of Religious Education. My topic: "Caring for the Environment: Does the Catholic Church Have a Voice?" So, "where are the Catholic environmentalists?" We are here, and working locally, as I have been for more than twenty-five years, in one way or another--including as the subject of my doctoral dissertation at Fordham University in mid 1990. Jeffrey Guhin gives a summary of the Catholic response to what has usually been called "the environmental crisis" and that is always welcomed. And he is right to stress the local. I would like to add that my own sense is that we need to concentrate more on the urban environemnt, because that is where most of us live--it's as local as most of us get. He, and others, might be interested in taking a look at my May 2003 article published in the journal New Theology Review. It's entitled, "Does God Live in the City:Ecology, Theology, and Urban Space." To get really effective locally, I think, is to recognize the city scape as also a place to find God's creative presence and our own responsiblity for taking care of the environment which surrounds us. I am reminded of a quote from Dorothy Day which I use in that article,in which she describes, "that splendid globe of the sun, one street wide, framed at the foot of East Fourteenth Street." That's local appreciation we can all turn into responsiblity for the well-being of this planet earth. 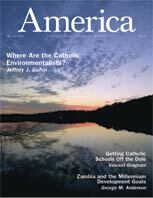 Jeffrey Guhin asks "Where Are the Catholic Environmentalists?" Perhaps there are more of us than anyone realizes. Now is the time for action. With accelerating population, finite resources, and public policy that perceives the Earth as commodity instead of gift, we are on the path to environmental catastrophe. That catastrophe would be comprehensive; it would not only devastate the Earth, but would have destructive consequences for the human family. How can theology provide helpful insights? How can it facilitate political action that is distinctively Catholic? Liberation theologians might offer a helpful hint; they employed a secular ideology--Marxism--that provided helpful tools for analyzing Latin American society and producing concrete social transformation. I am not advocating a Marxist response. But I am suggesting that a conversation partner could enhance the theological critique of the current situation and challenge Catholic environmentalists to act. I think that the green political model presents a strong option. The seven core values of the greens--grassroots democracy, social justice, ecological wisdom, non-violence, decentralization, community-based economics, and feminism--have numerous parallels in Catholic social teaching. Critical engagement with this political model would invigorate and clarify the church’s teaching and commitment. Catholic environmentalists could use these values to inform their thought and action, without wholeheartedly embracing them. Paul wrote, “Test everything; retain what is good.” Let us pray that Catholic environmentalists use this wisdom as they devise creative responses to the current situation. Pope John Paul II stated quite clearly his view of a Christian’s attitude toward this planet on which we live—a moral matter, as I recall. I long wondered whether his message was being announced among the faithful, although several bishops’ groups have written pastorals on the subject. It was therefore a joy to read, nearly a year ago, the article “Where Are the Catholic Environmentalists?” by Jeffrey J. Guhin (2/13/06), and to learn of the thinking of Elizabeth Johnson, C.S.J. and Miriam Therese MacGillis, O.P. And now, over the course of two months, three more articles have appeared with regard to our earth: about the universe, “energy ethics” and global warming. I hope there is a sufficient number of people reading this material, because I do not hear the topic being treated from the pulpit. Is not what happens on earth, to earth and subsequently to earth’s inhabitants a concern for life? I was present at the presentation given by Elizabeth Johnson to Catholic high school teachers which Jeffrey Guhin mentions in his article. His concerns regarding environmentalism being a "white privilege" were not those of the audience.Many of them had been in Catholic education for the better part of a lifetime and knew the territory substantially better than Jeffrey did. The challenges presented to the environment impact the poor most of all and those challenges to our students' health and futures were abundantly evident to those who had spent a lifetime educating this city's children, poor and well-to-do alike. Guhin's comments recalled a pointed conversation between Thomas Berry and Jon Sobrino at the College Theology Society annual meeting a number of years ago. Frustrated with Berry's presentation, Sobrino wondered how Berry could equate the life of a starving child with the death of a bird! The remarks of Leonardo Boff are helpful in this connection. Boff suggests a connection between environmental and human rights concerns, a preferential option for the poor and a preferential option for the earth, especially in the areas of indigenous cultures of the Amazon rain forest. (Ecology and Liberation, Orbis, 1995) The challenge for all of us is to heed the challenge of Johnson and Sobrino. Educators committed to the gospel need to keep the face of the dying child and the threatened earth in the forefront of their imaginations. As a Catholic educator with more than thirty years experience I have never felt a lack of concern for both challenges on the part of my colleagues-many of who were irritated, enraged or simply amused by the comments of a rookie teacher that day. This article also appeared in print, under the headline "Where Are the Catholic Environmentalists?," in the February 13, 2006 issue. Jeffrey J. Guhin, an associate editor at BustedHalo.com, teaches English at St. Joseph High School in Brooklyn, N.Y.